The writer/director Armando Iannucci has never let good taste get in the way of a good and bitter laugh. The work he’s best known for here in the States, the HBO comedy “Veep,” gets mad mileage out of depicting American politicos as not just bird-brained and venal but as actively, crassly awful. The relentless self-interest of its central character, Selina Meyer, spreads like a particularly vehement poison ivy into every aspect of her being. She’s funny because she’s shocking—shocking in ways that you don’t want to believe another human being can be. So there’s a sense in which portraying one of the greatest monsters of the 20th century, the Soviet Union’s brutal dictator Stalin, makes sense for an artist like Iannucci. First there’s the challenge. Then there’s the fact that people are going to say he’s gone too far. Which, peripherally, brings up another question: all the politicians depicted on “Veep” have blood on their hands, while Stalin was a mass murderer of a different class. Is there a metric on how many people you’ve killed before it becomes a form of sacrilege to satirize you? 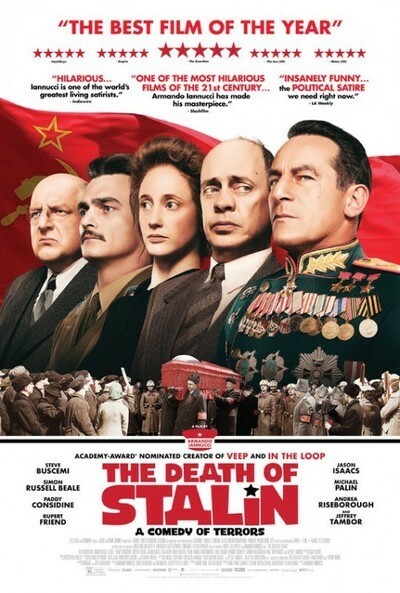 In a way, the question is moot, or half-moot, here, because “The Death of Stalin” is about just that: the power grab of Soviet apparatchiks in the immediate aftermath of Stalin’s shuffle off this mortal coil. The movie, written by Iannucci with David Schneider, Ian Martin, and Peter Fellows, hews pretty closely at first to the graphic novel by Fabien Nury and Thierry Robin on which it is based. The movie begins with a disaster. On Radio Moscow one evening, the pianist Maria Yudina and orchestra do a heckuva job on a Mozart program. So much so that Stalin phones in and asks that a recording be sent over to his dacha. One problem: Radio Moscow wasn’t recording. Panic ensues; only one solution is possible: restage the concert and record it. Maria, who lost a relative to Dear Leader, refuses until she’s sufficiently bribed. The conductor drops out in mortal fear: what if his work on the re-creation isn’t up to snuff? The work eventually gets done, an acetate is prepared, and Maria slips a poison pen note into the sleeve. Reading it, Stalin … drops dead. Secret police leader Beria (Simon Russell Beale), accompanied by highly hapless CP Central Committee bigwig Malenkov (Jeffrey Tambor) take charge of the situation, with Beria discovering, and pocketing, the note. Other Central Committee members, including Nikita Khrushchev (Steve Buscemi), soon show up, and the jockeying for advantage extends to the order in which all their limousines leave from the dacha. The plotting and backstabbing grows more elaborate as funeral arrangements are made, and Stalin’s children have to be dealt with. The Western politicos in prior Iannucci works—the series “The Thick of It” and “Veep,” and the movie “In The Loop”—used armies and drones to kill for them. The figures depicted here have no compunction about taking out a pistol and putting a bullet in someone’s brain. They’ll kidnap and imprison someone’s wife in a long game of power extortion. And so on. Does their murderousness make them less funny? It’s clear that Iannucci is not going for a full-on iteration of his brand of comedy. Yes, “The Death of Stalin” is a kind of farce, but it’s a mordant one. It never asks us to laugh at cruelty; it does make us laugh at the absurd pettiness and ultimate small-mindedness of the men perpetrating that cruelty. And Iannucci is a superb ringmaster. Eschewing the banal, flat-footed conventions of verisimilitude, Iannucci has each of the cast members speak as he or she normally does from Simon Russell Beale’s high-end London tones to Steve Buscemi’s Brooklynese. The effect is of the creation of a standalone reality, and I think it works. For comparison, lend an ear to the array of clumsy Boris-and-Natasha “Russian” accents thrown around in “Red Sparrow” and get back to me. In any event, it allows the virtuoso cast to have at each other in a brisk and seemingly spontaneous a way as possible. You get a feel for the characters that transcends accents. Most provocatively, Iannucci assays a moderately sympathetic portrait of Khrushchev, despite the awful murderous action he takes in his quest to seize power. Expanding the characterization in the graphic novel, he brings Khrushchev’s sincere desire for reform to the forefront. The point Iannucci makes by so doing is an uncomfortable one. But this is a movie that wants you uncomfortable, in a variety of ways. Even when you’re laughing, and you will be.